The long awaited and newest Disney Princess movie – Moana – has reached theaters, so, let’s talk about it! IMDb summary: In Ancient Polynesia, when a terrible curse incurred by Maui reaches an impetuous Chieftain’s daughter’s island, she answers the Ocean’s call to seek out the demigod to set things right. Moana is, technically, a 13th Disney Princess film. It has been truly amazing to see how this brand evolved in the past 80 years. I feel that the biggest changes started with 2010’s Tangled and all the films following it have been adapting their stories and characters to fit the contemporary world and I’m excited to see what will Disney do next. Moana is also Disney’s return to musicals, since Frozen 3 years ago. Can Moana’s soundtrack replicate the success of Frozen’s soundtrack? It is gonna be a bit harder for Moana, as this year, we already had one fairly successful animated musical – Trolls – and we also have another one coming up – Sing. Lastly, Moana is Disney’s attempt at presenting an indigenous – Polynesian culture – to the global market. Thier last attempt at this with Pocahontas wasn’t the most successful, but I think that Disney learned from their mistakes. They went an extra mile to cast voice actors from appropriate backgrounds and also employed anthropologists to help portray Polynesian culture as accurately as possible. As a student of anthropology and a lover of films, I found that fascinating – maybe this can be my job in the future? Moana’s story also appealed to me on two personal levels. First of all, I, as a longtime professional(-ish) swimmer, sometimes do feel better in the water than on land, so I loved seeing Moana’s connection to the ocean. Secondly, Moana reminded me of two different books that I read as a kid that both revolved around islands and island culture. One of them was Whale Rider (1987) by Witi Ihimaera about a Maori girl and her journey to becoming her clan’s chief. The other was called Island of the Blue Dolphins (1960) by Scott O’Dell about a Native American girl who gets stranded on an island near California. Both books have been turned into movies, in 2002 and 1964 respectively. Jared Bush, who has previously worked on Big Hero 6 and also co-wrote and co-directed Zootopia, wrote the screenplay of Moana but a lot of people got the credits for the story, including the directors of this film Ron Clements and John Musker, Big Hero 6’s directors Chris Williams and Don Hall, Wreck-It Ralph 2’s writer Pamela Ribon, and twin Hawaiian screenwriters Aaron and Jordan Kandell. For the most part, I really enjoyed the writing for Moana. I loved that the movie opened with a lesson in Polynesian mythology. In general, I thought that this specific culture was represented with respect but it was still made fun. The writing for the two main characters was also great. Where the movie’s magic kinda broke down was in the actual narrative of the film. The first act felt a bit drawn out – I wanted to get onto the adventure part quicker. I felt that the movie was just basically checking things off a list in during the set-up: Moana had Disney staples such as the dead relative/teacher, the overprotective parents, and the idea that everyone should stay in their place. The ending was also a bit predictable and I wish they would have done without the cliches like failing at first try and leaving and coming back in the heat of the battle. Nevertheless, a few narrative ideas that I thought were great was the fact that Moana didn’t have or need a love interest. Also, the final confrontation was female-centric, similarly to Frozen, and I would have had a problem with that if Moana didn’t have strong and cool male character – Maui – as well. Ron Clements and John Musker, who have made such Disney classic as The Little Mermaid, Alladin, Hercules, and Princess and the Frog, directed the film and did a wonderful job. The pacing of the film could have been better but I absolutely adored the visuals and the animation. All the environment, especially the ocean, were brought to life just magnificently – the water looked both realistic and magical – so much better than another recent water based animation Finding Dory. The character design was also super cool. Moana actually looked like a real person, with realistic body proportions! Maui looked super cool too – I liked that his tattoos were not only a visual prop but a part of the plot. Moana’s sidekicks were good too. The chicken was mostly used for comic relief which was neither a hit or a miss for me. I wish, however, that they would have brought the piggy along for the ride, as he was super cute. The baby Moana was also so adorable. You couldn’t not fall in love with her. Lastly, one of my favorite parts of the film was the good old training montage for both Moana and Maui. Tarzan’s composer Mark Mancina, Hamilton’s Lin-Manuel Miranda, and a member of Oceanic music group Te Vaka – Opetaia Foa’i – all worked on the soundtrack and did an amazing job. To being with, I loved hearing some of the songs in Tokelauan language – it added more authenticity to the film’s atmosphere. The more mainstream pop-songy numbers were also great. I see a lot of potential in one song especially in finally making the world let go of Let it Go – I’m talking about the main song of Moana – How Far I’ll Go. I liked the version sung by Cravalho much more than Alessia Cara’s credits version. Even though I love Cara and her lyrics, I felt that Cravalho voice just had more emotion and fit the song better. But I can see why Disney wanted a more well-known singer to record a version of the song. Let it Go was also recorded by Idina Menzel and a more mainstream choice Demi Lovato. Other two songs that I’d like to name are You’re Welcome by Dwayne Johnson. I was super impressed with Johnson’s voice – is there anything he can’t do? The song itself kinda reminded me of another Disney tune whose name I don’t remember, but it just sounded so familiar. The last song I’m gonna mention was the one sung by the crab – that was the only part of the score that I didn’t feel on board with. Auli’i Cravalho was amazing as Moana. Her voice just had so much emotion and fit the character perfectly. I think she has a long career ahead of her, at least I hope so. Dwayne Johnson as Maui was great too. He just had so much charisma in his voice alone. This was only his second voice role. Next year, he has 3 big movies coming up – Fast 8, Baywatch, and Jumanji. In short, Moana was another great picture from Disney. It had spectacular characters, nice thematical ideas and gorgeous animated visuals. I only wish they would have made the story a bit more original. P.S. Before Moana, a new Disney short called, Inner Workings, was screened. It was kinda the Inside Out of the body rather than the mind. It was both funny and cute as well as sad and depressing (like Pixar levels sad). Loved the main message – treat yourself, escape the routine and enjoy life! Welcome to another segment of Collections. I have shared my nail polish and postcards’ collection with you before but now I will show you my room’s wall decorations. Mostly, my walls are covered with posters that represent all of my obsessions (TV shows, movies, books, comics, singers and so forth). All of the posters are custom made or bought at the concerts. Other decorations include a wall clock, couple of paintings I have painted myself, couple of inspirational quotes, my medals from various sports I do and two flags of the countries I wish to live in someday. Let’s begin, shall we? I have 11 posters, I use to have more but now I have taken them down. My first poster (TVD and GG) are about 5 years old. 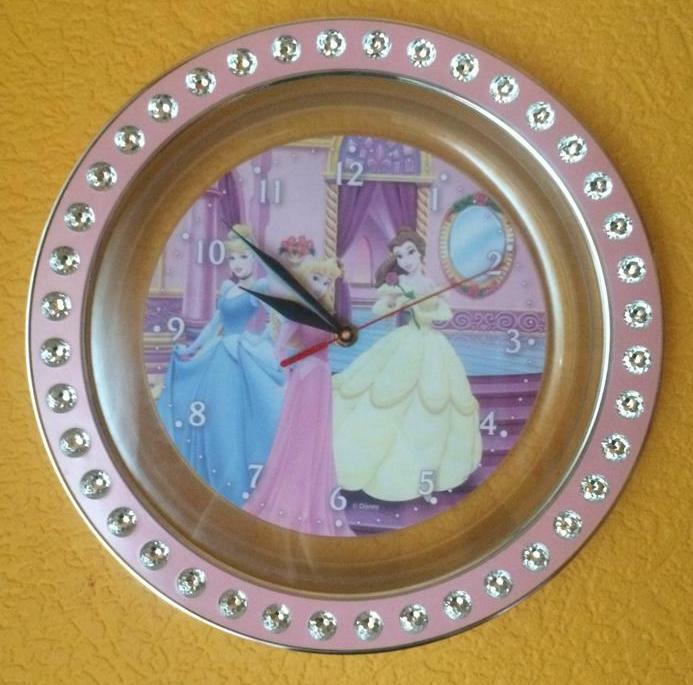 My o’clock is very girly: its Disney pink clock with Sleeping Beauty, Cinderella and Belle from Beauty and the Beast. These 4 paintings are all painted by me using Paint by numbers canvases. The quote underneath them is the quote I saw on one of the swimmers from London 2012 Olympics T-shirt and found it really inspiring, so decided to hang it on my wall. 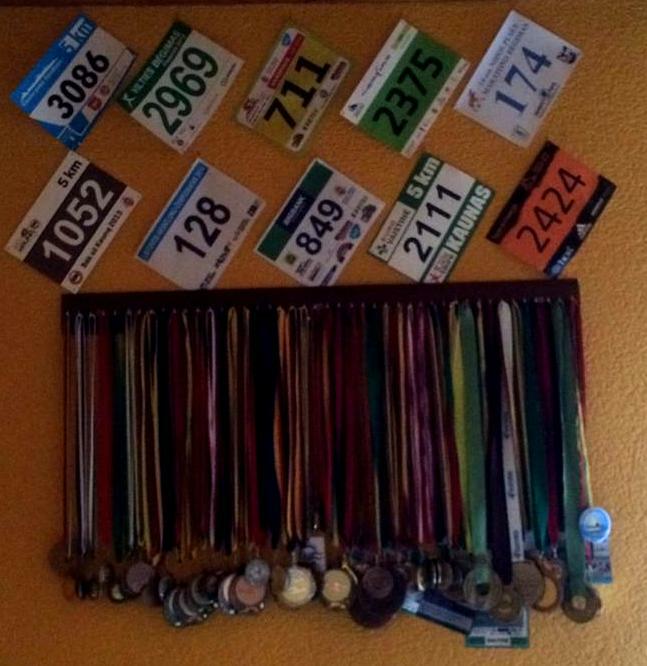 Here you can see 55 medals that I have won in swimming, running, bicycle sport and aquathlon. Above them are numbers from running and cycling competitions. 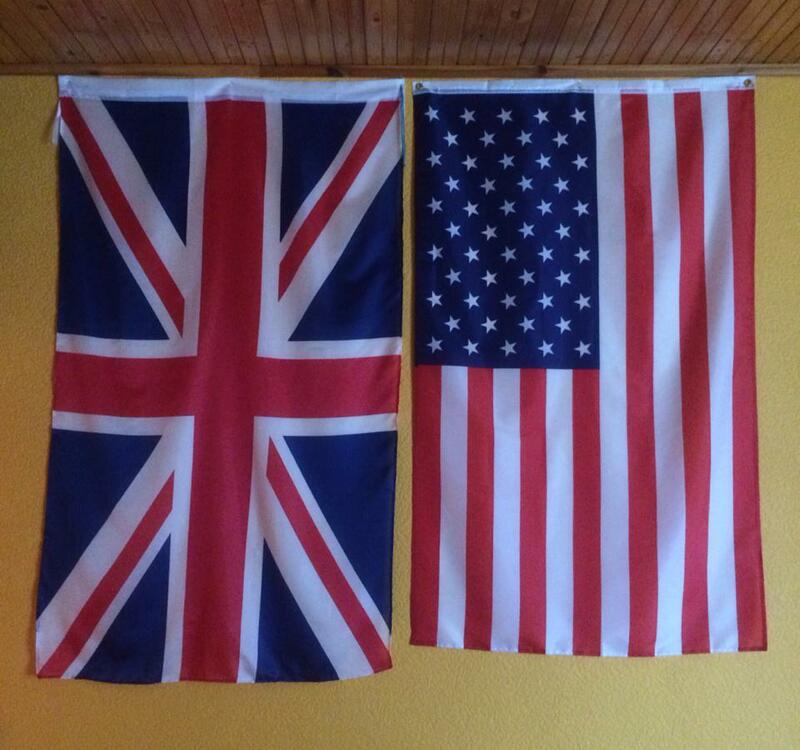 And here is my favorite part of my room (although, I do love all of it) – US and UK flags. I wish to study in the US and then live for a while in the UK. My walls used to be white but 4 years ago we repainted them into orange. 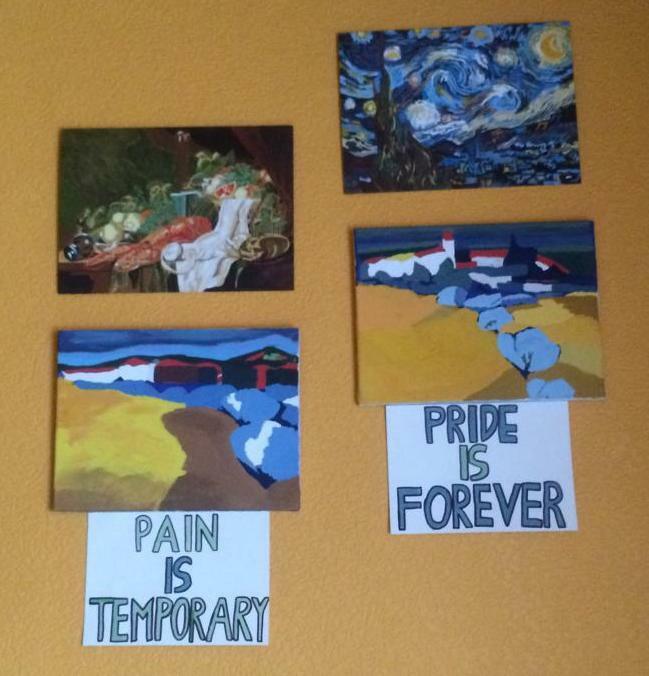 I also have an inspiration/mood board above my desk with inspirational quotes, sayings, tiny paintings and symbols that mean something to me, but I am going to save it for a separate post. So, I hope you liked seeing my room, even if it was just a tiny bit of it. Bye!